Ruien Energy Storage NV is a joint venture between the Japanese listed company Nippon Koei and the Belgium company Yuso. 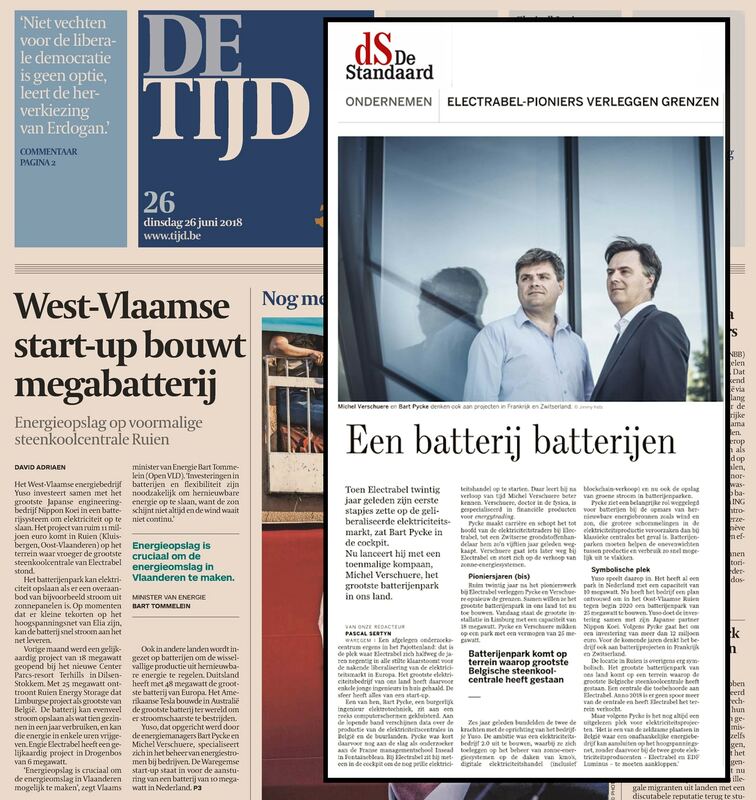 RES NV is currently developing a battery-based energy storage system in Ruien (East Flanders, Belgium). The BESS targets to deliver ancillary services to European grid operators (TSOs) as well as more localized energy service offerings at the site of the former 800MW coal fired power plant currently under post-decommissioning redevelopment. The Ruien BESS project and Yuso platform will be presented to the press, interested business partners and other stakeholders during an evening event on Wednesday 5th of September at 18h in Waregem, Belgium. Founded in 1946, Nippon Koei (NK, 1954 JP) is the oldest independent engineering consulting firm in Japan and has worked on over 5000 multi-disciplinary infrastructure projects in 160 countries all over the world. NK’s engineering consulting service solutions cover the whole spectrum of energy infrastructure, transportation infrastructure, water and sanitation, environment and agriculture, urban and industry and public sectors. With regards to its energy business, NK has strong relationships with transmission operators and a dominant market share in substation control system equipment especially with TEPCO. Through its extensive research and development, NK’s successful track record for energy business includes (i) hydropower: supervised constructions of 60 hydropower dams totaling 20,000 MW of installed capacity; (ii) power transmission and distribution networks: delivered over 5,000km of transmission lines in more than 40 countries; (iii) renewable energy: provided in-depth studies on introducing and promoting renewable energy especially in rural and remote areas; (iv) thermal power: designed and supervised the construction of thermal power plants (gas turbine, diesel power and coal-fired thermal); and (v) energy conservation: audited energy used for more than 200 buildings and factories which help to achieve 20-30% cost savings. For more than 70 years NK provided engineering consulting and EPC services to major energy players in Japan and abroad. The company now supports energy transition focused on new business models such as energy storage, micro grids and VPP. Yuso BVBA is a Waregem, Belgium based company founded by Bart Pycke and Michel Verschuere in 2012. The company is a platform player, employing state-of-the-art proprietary systems to provide market access to over 500 industrial-sized producers of renewable energy (mainly Solar PV) in Belgium. Yuso has provided market access and energy flexibility services to a BESS based in The Netherlands and owned by the American utility AES since 2016 (www.aes.com). Yuso combines the 35+ year experience of its management in market functioning with deep understanding of cloud-based IT infrastructure, automated portfolio management and meteorology to optimize the energy needs of its customer base. Do you want to know more about the Ruien Energy Storage project?